This article is about a 1971 spaceflight. For the mission identified by NASA as ISS Soyuz 11, see Soyuz TMA-7. Soyuz 11 (Russian: Союз 11, Union 11) was the only manned mission to board the world's first space station, Salyut 1 (Soyuz 10 had soft-docked but had not been able to enter due to latching problems). The crew, Georgy Dobrovolsky, Vladislav Volkov, and Viktor Patsayev, arrived at the space station on 7 June 1971 and departed on 29 June. The mission ended in disaster when the crew capsule depressurized during preparations for reentry, killing the three-man crew. The three crew members of Soyuz 11 are the only humans known to have died in space. The original prime crew for Soyuz 11 consisted of Alexei Leonov, Valeri Kubasov and Pyotr Kolodin. A medical X-ray examination four days before launch suggested that Kubasov might have tuberculosis, and according to the mission rules, the prime crew was replaced with the backup crew. For Dobrovolski and Patsayev, this was to be their first space mission. After the failure of Salyut 2 to orbit, Kubasov and Leonov were reassigned to Soyuz 19 for the Apollo-Soyuz Test Project in 1975. The Soyuz 7K-OKS spacecraft was launched on 6 June 1971, from Baikonur Cosmodrome in central Kazakh SSR. Several months earlier, the first mission to the Salyut, Soyuz 10, had failed to successfully dock with the station. Soyuz 11 successfully docked with Salyut 1 on 7 June and the cosmonauts remained on board for 22 days, setting space endurance records that would hold until the American Skylab 2 mission in May–June 1973. Upon first entering the station, the crew encountered a smoky and burnt atmosphere and after replacing part of the ventilation system spent the next day back in their Soyuz until the air cleared. Their stay in Salyut was productive, including live television broadcasts. A fire broke out on day 11 of their stay, causing mission planners to consider abandoning the station. The planned highlight of the mission was to have been the observation of an N1 rocket launch, but the launch was postponed. The crew also found that using the exercise treadmill as they were required to twice a day caused the whole station to vibrate. Pravda released news of the mission and regular updates while it was in progress. On 30 June 1971 (Moscow time), after an apparently normal reentry of the capsule of the Soyuz 11 mission, the recovery team opened the capsule to find the crew dead. Kerim Kerimov, chair of the State Commission, recalled: "Outwardly, there was no damage whatsoever. They knocked on the side, but there was no response from within. On opening the hatch, they found all three men in their couches, motionless, with dark-blue patches on their faces and trails of blood from their noses and ears. They removed them from the descent module. Dobrovolsky was still warm. The doctors gave artificial respiration. Based on their reports, the cause of death was suffocation." It quickly became apparent that they had asphyxiated. The fault was traced to a breathing ventilation valve, located between the orbital module and the descent module, that had been jolted open as the descent module separated from the service module, 12 minutes and 3 seconds after retrofire. The two were held together by explosive bolts designed to fire sequentially; in fact, they had fired simultaneously. The explosive force of the simultaneous bolt firing caused the internal mechanism of the pressure equalization valve to loosen a seal that was usually discarded later and which normally allowed for automatic adjustment of the cabin pressure. The valve opened at an altitude of 168 kilometres (551,000 ft), and the resultant loss of pressure was fatal within seconds. The valve was located beneath the seats and was impossible to find and block before the air was lost. Flight recorder data from the single cosmonaut outfitted with biomedical sensors showed cardiac arrest occurred within 40 seconds of pressure loss. By 15 minutes, 35 seconds after retrofire, the cabin pressure was zero, and remained there until the capsule entered the Earth's atmosphere. Patsayev's body was found positioned near the valve, and he may have been attempting to close or block the valve at the time he lost consciousness. An extensive investigation was conducted to study all components and systems of Soyuz 11 that could have caused the accident, although doctors quickly concluded that the cosmonauts had died of asphyxiation. Examination of the descent module showed that it was in excellent condition and there was no damage to it in the forms of cracks or ruptures of the hull. The autopsies took place at Burdenko Military Hospital and found that the cause of death proper for the cosmonauts was hemorrhaging of the blood vessels in the brain, with lesser amounts of bleeding under their skin, in the inner ear, and in the nasal cavity, all of which occurred as exposure to a vacuum environment caused the oxygen and nitrogen in their bloodstreams to bubble and rupture vessels. Their blood was also found to contain heavy concentrations of lactic acid, a sign of extreme physiologic stress. Although they could have remained conscious for almost a minute after decompression began, less than 20 seconds would have passed before the effects of oxygen starvation made it impossible for them to function. Alexei Leonov, who would have originally commanded Soyuz 11, had advised the cosmonauts before the flight that they should manually close the valves between the orbital and descent modules as he did not trust them to shut automatically, a procedure he thought up during extensive time in the Soyuz simulator. However, Dobrovolsky, Volkov, and Patsayev either chose to disregard his warnings or else forgot about them during the lengthy mission. After the flight, Leonov went back and tried closing one of the valves himself and found that it took nearly a minute to do, too long in an emergency situation with the spacecraft's atmosphere escaping fast. The Soviet state media attempted to downplay the tragic end of the mission and instead emphasized its accomplishments during the crew's stay aboard Salyut 1. Since they did not publicly announce the exact cause of the cosmonauts' deaths for almost two years afterwards, US space planners were extremely worried about the upcoming Skylab program as they could not be certain whether prolonged time in zero gravity had turned out to be fatal. However, NASA doctor Charles Berry maintained a firm conviction that the cosmonauts could not have died from spending too many weeks in microgravity. Until the Soviets finally disclosed what had really happened, Dr. Berry theorized that the crew had died from inhaling toxic substances. A film that was later declassified showed support crews attempting CPR on the cosmonauts. It was not known until an autopsy that they had died because of a capsule depressurisation. The ground crew had lost audio contact with the crew before reentry began and had already begun preparations for contingencies in case the crew had been lost. The cosmonauts were given a large state funeral and buried in the Kremlin Wall Necropolis at Red Square, Moscow near the remains of Yuri Gagarin. US astronaut Tom Stafford was one of the pallbearers. They were also each posthumously awarded the Hero of the Soviet Union medal. The American people join in expressing to you and the Soviet people our deepest sympathy on the tragic deaths of the three Soviet cosmonauts. The whole world followed the exploits of these courageous explorers of the unknown and shares the anguish of their tragedy. But the achievements of cosmonauts Dobrovolsky, Volkov and Patsayev remain. It will, I am sure, prove to have contributed greatly to the further achievements of the Soviet program for the exploration of space and thus to the widening of man's horizons. The Soyuz spacecraft was extensively redesigned after this incident to carry only two cosmonauts. The extra room meant that the crew could wear Sokol space suits during launch and landing. The Sokol was a lightweight pressure suit intended for emergency use; updated versions of the suit remain in use to the present day. A Soyuz capsule would not hold three crew members again until the Soyuz-T redesign in 1980, which freed enough space for three people in lightweight pressure suits to travel in the capsule. The Soyuz 11 landing coordinates are 47°21′24″N 70°07′17″E﻿ / ﻿47.35663°N 70.12142°E﻿ / 47.35663; 70.12142 which is 90 km southwest of Karazhal, Karagandy, Kazakhstan and about 550 km northeast of Baikonur. At the site was placed a memorial monument in the form of a three-sided metallic column, with the engraved image of the face of each crew member set into a stylized triangle on each of the three sides near the top. The memorial is in open, flat country, far from any populated area, within a small, circular fence. [original research?] In 2012, the memorial was found to have been vandalized beyond repair, with only the base of the metallic column remaining. However, in 2013, Russian space agency Roscosmos restored the site with a redesigned monument, reflecting the three-sided form of the original but this time constructed from brick. Also placed at the site was a sign explaining the history of the location and the fate of the original monument. Craters on the Moon were named after the three cosmonauts: Dobrovol'skiy, Volkov, and Patsaev. The names of the three cosmonauts are included on the Fallen Astronaut commemorative plaque placed on the Moon during the Apollo 15 mission in August 1971. To honor the loss of the Soyuz 11 crew, a group of hills on Pluto is also named Soyuz Colles. ^ "Baikonur LC1". Encyclopedia Astronautica. Archived from the original on 15 April 2009. Retrieved 4 March 2009. ^ "Google Maps – Soyuz 11 Landing Site – Monument Location". Retrieved 25 December 2010. ^ "Google Maps – Soyuz 11 Landing Site – Monument Photo". Retrieved 25 December 2010. ^ McDowell, Jonathan. "SATCAT". Jonathan's Space Pages. Retrieved 23 March 2014. ^ a b Encyclopedia Astronautica (2007). "Soyuz 11". Encyclopedia Astronautica. Archived from the original on 30 October 2007. Retrieved 20 October 2007. ^ Mamta Trivedi (2001). "30 Years Ago: The World's First Space Station, Salyut 1". Space.com – Imaginova Corp. Archived from the original on 6 June 2001. Retrieved 20 October 2007. ^ CNN (1997). "After glory era, cash woes hobble Russian space program". CNN. Retrieved 20 October 2007. ^ a b c d Time Magazine (12 July 1971). "Triumph and Tragedy of Soyuz 11". Time Magazine. Retrieved 20 October 2007. ^ "Space disasters and near misses". Channel 4. Archived from the original on 12 October 2008. Retrieved 29 June 2011. ^ Time Magazine (10 May 1971). "A Troubled Salyut". Time Magazine. Retrieved 20 October 2007. ^ a b National Aeronautics and Space Administration (NASA) (2007). "Soyuz 11: Triumph and Tragedy". NASA -National Space Science Data Center. Retrieved 19 June 2013. ^ USA Today (1 February 2003). "Deadly accidents in the history of space exploration". USA Today. Retrieved 20 October 2007. ^ a b Ben Evans (24 April 2013). "The Crew That Never Came Home: The Misfortunes of Soyuz 11". Space Safety Magazine. Retrieved 8 October 2013. ^ a b c d e NASA (1974). "The Partnership: A History of the Apollo-Soyuz Test Project". NASA. Archived from the original on 23 August 2007. Retrieved 20 October 2007. ^ NASA. 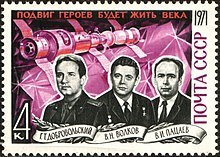 "The crew of Soyuz 11". NASA. Retrieved 20 October 2007. ^ Jane's Information Group (2003). "A brief history of space accidents". Jane's Information Group. Archived from the original on 5 October 2007. Retrieved 20 October 2007. ^ "Soyuz 11 CPR". Youtube. Retrieved 30 December 2014. ^ This footage was shown during the 1994 TV adaptation of the documentary Moon Shot by Alan Shepard and Deke Slayton. ^ "Google Maps – Soyuz 11 Landing Site – Monument Photo closeup". Retrieved 25 December 2010. ^ "О ПАМЯТНИКЕ КОСМОНАВТАМ (About Cosmonaut Monument)". 5 May 2012. ^ "ЦПК. В КАЗАХСТАНЕ ОТКРЫТ ВОССТАНОВЛЕННЫЙ ПАМЯТНИК ЭКИПАЖУ КОРАБЛЯ «СОЮЗ-11» (In Kazakhstan a restored monument was opened in remembrance of the crew of Soyuz-11)". 7 July 2016. Wikimedia Commons has media related to Soyuz 11. Ivanovich, Grujica S. (February 2008). Salyut – The First Space Station: Triumph and Tragedy. Praxis. pp. 300 pages. ISBN 0-387-73585-2. United States Congress: Office of Technology Assessment (30 March 2005). Salyut: Soviet Steps Toward Permanent Human Presence in Space – A Technical Memorandum. Seattle: University Press of the Pacific. pp. 80 pages. ISBN 1-4102-2138-5.